In a heroic display of gastronomic willpower, Gawker’s Caity Weaver spent 14 hours in a Brooklyn TGI Fridays, determined to put the chain’s new Endless Appetizer Showcase to the test. When it was all over, she had consumed 32 mozzarella sticks (at a rate of approximately 2.3 sticks per hour). If you haven’t read Weaver’s account of the day’s events, you absolutely should. But we couldn’t help but wonder: If you think the “endless” part of Endless Appetizer Showcase is a bluff, and you’re that determined to call TGI Fridays on it, why not choose the appetizer you can slam the most of? Then you could really test the limits of unlimited. The stakes are high: You have to choose one appetizer (there are seven options — but what human would choose the Tuscan spinach dip?) and eat only that appetizer, on repeat. Now, we know Weaver isn’t a professional eater, nor do we want her to get sick in the process, but Weaver could have done way more damage with the garlic and basil bruschetta. 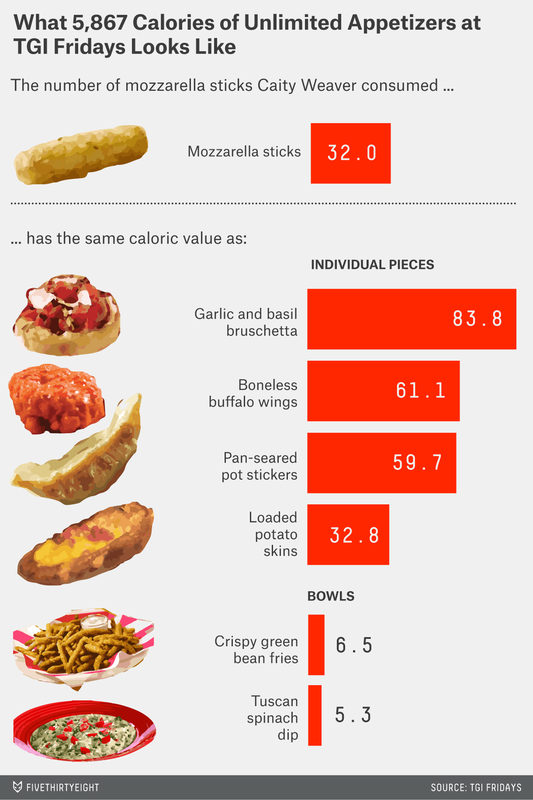 Those 32 mozzarella sticks add up to 5,867 calories. The bruschetta clocks in at just 350 calories per order, and there are “maybe like five or six?” per order (as an employee at a TGI Fridays in the Bronx told FiveThirtyEight). So, Weaver could have put away nearly 84 pieces of bruschetta — all that bruschetta at the same caloric cost.